Maintenance of garage door openers and fixing Garage Door Openers are not a big issue for most people. These units are installed by a professional usually and once installed, there is not much that needs to be done with them. Most will last from 5 to 20 years, some even longer without ever being touched, while others will need some sort of repair or adjustment from time to time. As we said there is not much to do, however when you are doing your quarterly check of your garage door ( see previous post) , it is a good idea to check a few things with respect to the automatic garage door opener as well. A simple check can add years to the system if bolts that are loose are tightened and the chain is working properly. check the batteries in the remotes that you use and replace them if required. check the safety stop of the garage door and adjust if needed. The safety stop makes sure that your door will stop and re-open if it finds that there is something blocking the closing of the door. It is very important to make sure this is working, especially if there are small children around. check that the door fully closes and fully opens, adjust if required. check the chain, and lubricate if needed. There are other types of mechanisms that are used besides chains. Check in your manual to confirm what kind of lubrication should be used and how often. Automatic garage door openers have become quite inexpensive and as a result you probably will not be able to find anyone who will be wiling to take them apart to repair them. Even if you can, by the time you pay to have it repaired, you will be pretty close to the cost of a new one. There are a few basic things you should do to confirm your door opener is really not working before you decide to replace it. try opening the door with other door openers, including the manual button that most people will have in their homes. check that the power is on and that a circuit breaker has not tripped for some reason, preventing power getting to the garage door opener. disengage the chain from the garage door and try operating the garage door opener. If it works there may be a problem with your door. Once you have tried all of these steps, you may want to call a repairmen, however there is a big trade off here in terms of what the cost will be to replace the door opener vs repairing it. Most people will opt for replacement since they have become so inexpensive. Of course there are always fancy multi featured door openers that can cost a great deal of money, however the inexpensive ones will cost somewhere between $100 to $200. You can barely get repairmen to show up for $100 these days and before you know it the cost of checking and repairing the system costs more than a new one. In addition there is no guarantee that he will be able to fix it. Our conclusion is that if you cannot fix it yourself, then you might as well put a new one in. There is really not much to a garage door opener. Essentially there are 4 parts. The electric motor, the gear box which connects to the chain. There is a printed circuit board which controls the motor. There is another printed circuit board which receives the transmissions from the remotes. Most units will have these functions combined on one printed circuit board. If you are not handy at all then you probably will not want to attempt these suggestions in this next section. First of all disconnect the power to prevent any possibility of electrical shock. Secondly, remove the cover on the housing of the door opener. You should be able to observe the 4 components we discussed earlier. At this point most people will only be able to observe whether there are any loose or frayed wires. They should check that the printed circuit board is properly seated in place. If you cannot see anything obvious, then you are looking at buying a new system. Repair any wires that are frayed or disconnected and then retry opening your door. Anyone with PCB expertise will probably enjoy the challenge of testing the board. However this is way beyond what most consumers are willing to consider and are able to do. There are many styles and types available. We suggest that you replace like for like if possible to make the entire job easier. There will be less adjustment of existing supports etc. You might even be able to use the same chain if it is still in good shape. 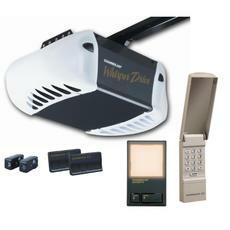 Hire a handyman if you are not comfortable with doing the installation of the automatic garage door opener yourself. This will cost you an additional fee. Good luck with maintaining your door and saving money. Comments are welcome. I would rather just replace my garage door opener , because I am not handy with these things!